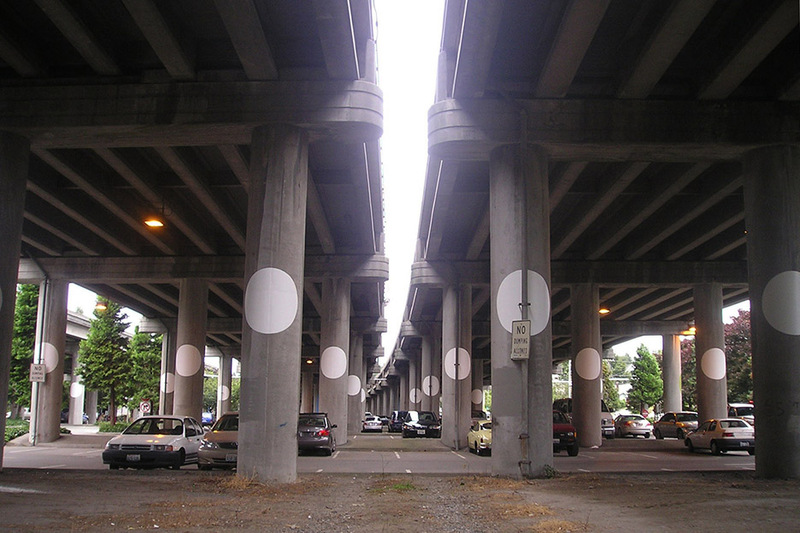 The I-5 underpass at Ravenna Boulevard and NE 65th St is a formidable expanse of freeway columns and parking lots. It's also the Roosevelt Green Lake Park 'n Ride. 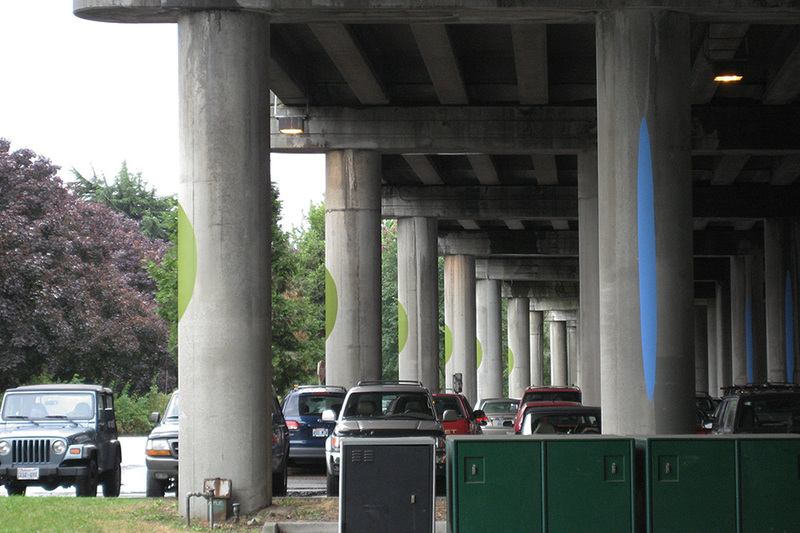 Roosevelt and Green Lake are two adjacent north-Seattle neighborhoods consisting of early 20th century bungalow-style homes, historic business districts, parks, bodies of water, schools, churches and other public buildings, and now the border between Roosevelt and Green Lake is the I-5 corridor. 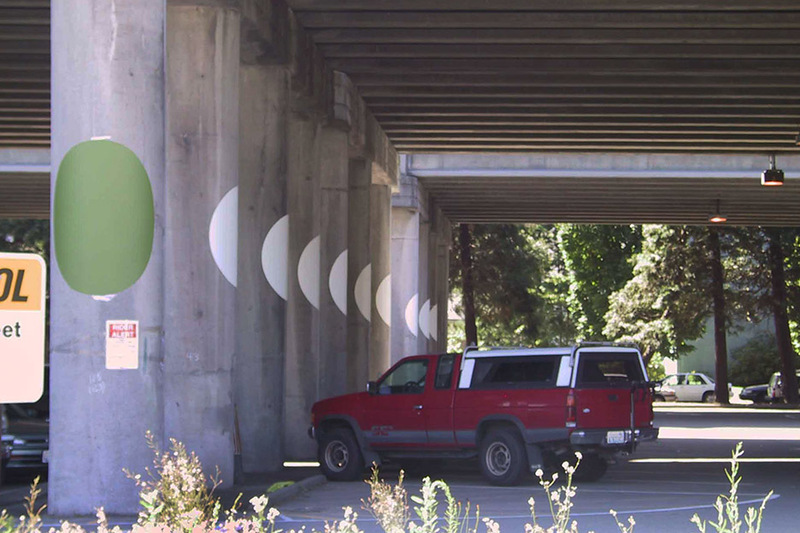 In addition to having created a major division between two neighborhoods that once were joined as a cohesive whole, the noise, darkness, dirtiness, and vast scale of the I-5 overpass created an unpleasant environment in the 10 acre site that threatened the small-town character of both neighborhoods. 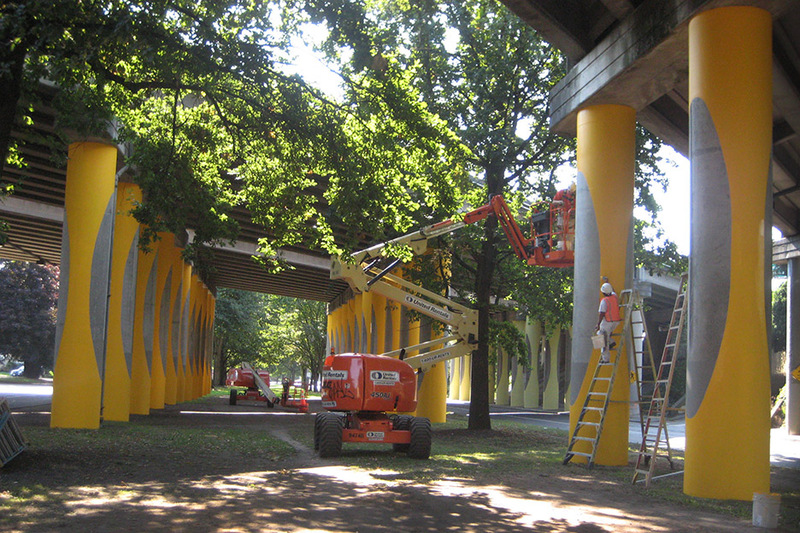 So in 2004, former council member Cynthia Sullivan engaged citizens of the Roosevelt, Green Lake, and Ravenna communities to identify the site as a priority for improvement and thanks to King County's 1% for Art commitment and Sullivan's initial support, the site underwent a complete transformation. 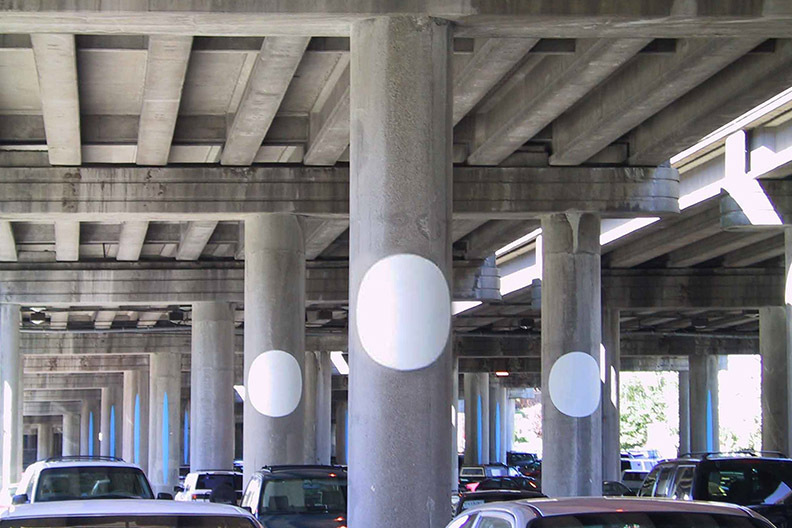 Rather than fight the massive existing infrastructure, the project works with the site's own visual vocabulary: parking paint and concrete columns. The lot was painted with simple shapes drawn from parking lot vernacular (white stripes / blue handicap) to minimize the dark space and accentuate the architecture. This family of shapes gives a graphic identity to the otherwise relentless and endless grey columns. 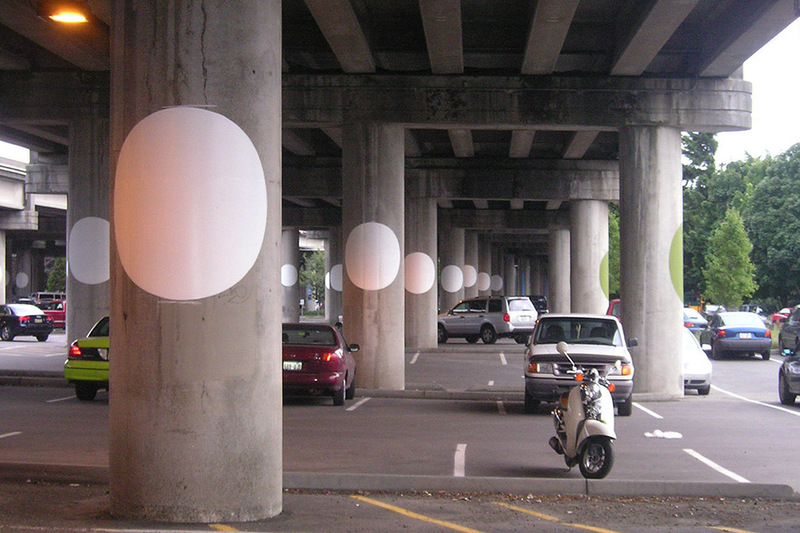 The white glossy circles take a bite out of the columns and make a series of receding moon shapes. The green ovals act as a graphic landscape to blend with the few trees that surround the site. 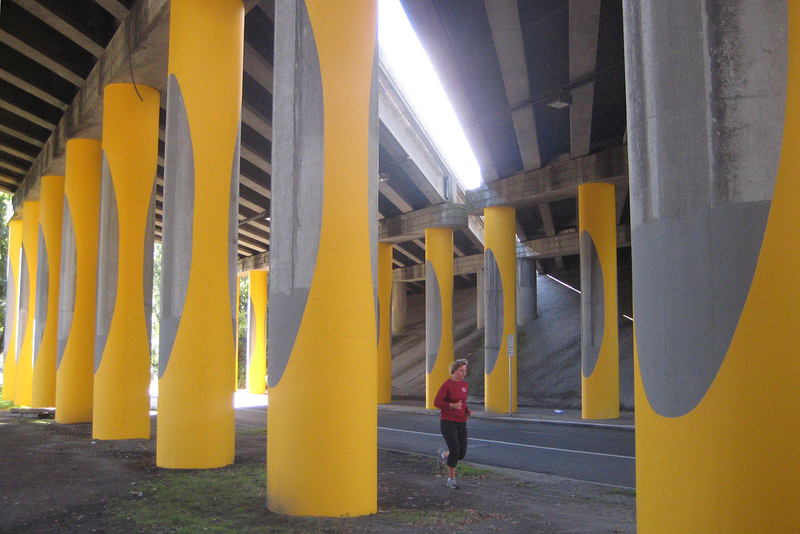 The 12' tall blue slots create openings in the columns and reinforce the 65th Street corridor, and the yellow-painted columns with central non-painted circles transform the concrete colonnades giving a new shapeliness to the passage. The painted shapes give direction and center to the space. The work is a contemporary, 3-D painting where space and shape relationships can be actively entered and explored. 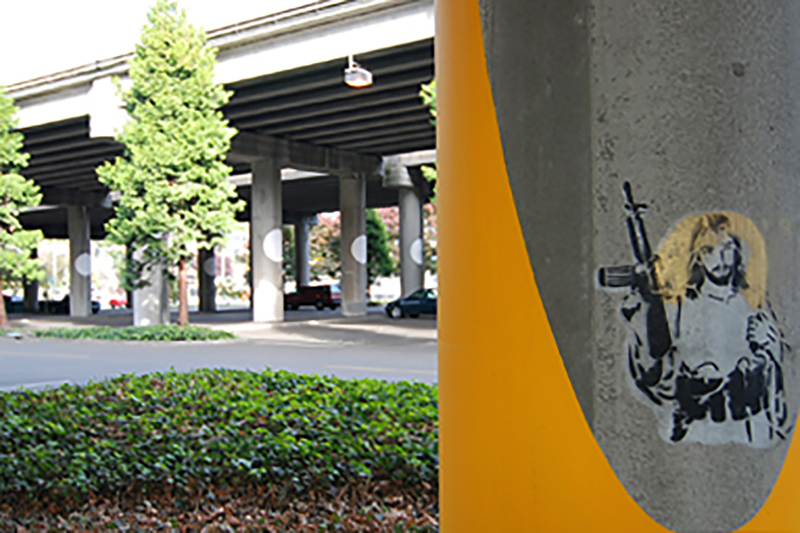 "Artist Sheila Klein's new work at the Roosevelt Green Lake Park & Ride is the evidence of a powerful new trend in civic engagement and an exciting work of art that inspires us to look for expressive opportunities in our existing infrastructure." 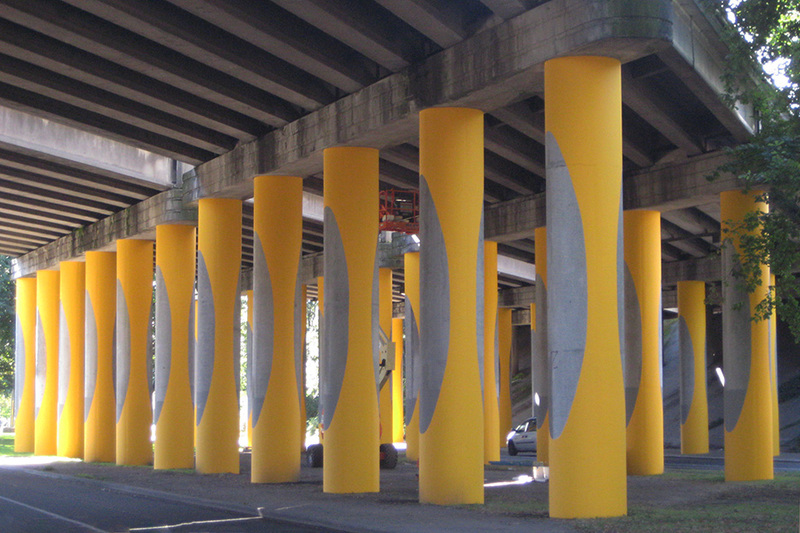 Columnseum (Roosevennavelt) at the Roosevelt Greenlake Park-and-Ride, wins national award. This art project is among 40 public artworks selected as the most successful and innovative of more than 300 entries nationwide. 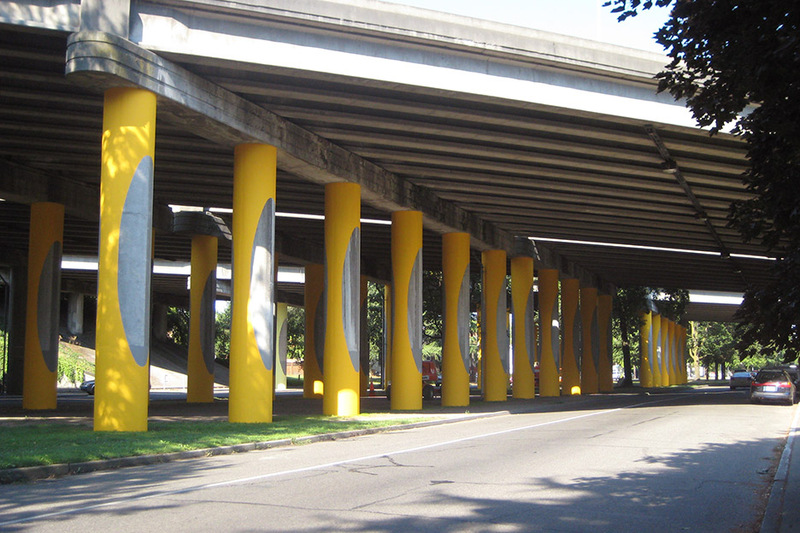 This is the ninth year that Americans for the Arts, the nation's leading nonprofit organization for advancing the arts in America, has recognized public artworks. The purpose of this award is to acknowledge the most outstanding and innovative public art projects produced in the previous year.